Goans are usually introduced to in their childhood. During cultural programs in school, many are taught to sing and often dance to the beats of the songs on stage for various programs. As such,it brings back childhood memories and one can immediately start singing the lines of the Dekhni with zest. ‘I Vetam’ by Carlos Eugenio Ferreira was first published in Paris in 1895 and then in Goa in 1926. The song was adapted by Raj Kapoor as ‘Na mangun sona chandi’ in his Hindi movie ‘Bobby’. The lyrics of the song are about two temple dancers who want to go for Damu’s wedding and they approach the boatman to ferry them across the river. When he declines because the river is rough, he is offered gold jewellery in barter, but he still refuses. 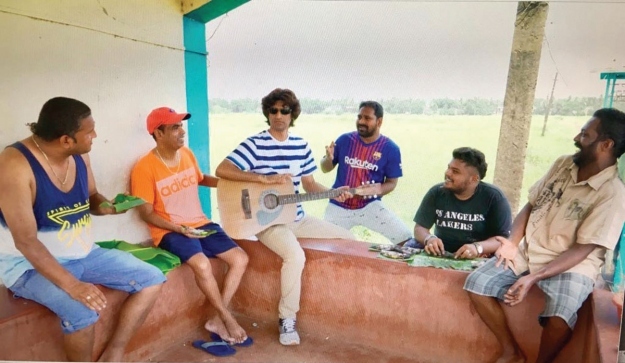 The song was shot at the green and picturesque village of St Estevam and different elements for the video were added on the spot. “The cast in the song were selected on the spot, without any planning. The boys cast for the video, Vijay Menezes, Roland Afonso, Francis Gomes, Sheldon Alphonso and Molivoi Silveira, are actually my friends from my village. Smita Naik, Pradnya Naik, and Pooja Naik were asked if they could join us for the video on the shoot day itself; thankfully, they said yes. Another interesting part of the video is that there are no trained or glamorous artistes; everything is very natural, which makes the overall product more appealing. My village friends are always very supportive and enthusiastic. I am always proud of St Estevam as the villagers are amazing,” says Mukesh.